This isn't a card trick, this is a close-up card miracle. Odds are you haven't seen this effect performed and if you have, it doesn't FEEL like a miracle. There's not even a handful of people that I've seen accomplish this in a clean manner. I performed this twice in the last few days to make sure it wasn't just a fluke. I'm willing to perform it again and get it on camera if possible, but there's no guarantee. The effect is this: a participant is given a deck of cards and asked to think of a card. They hold their hand over the deck until a number comes to mind for a reason they can't explain. They deal through the deck FACE-UP until they reach the number they chose. THEY are holding the deck during this. THEY turn over the last card and it is the card they were thinking of. It all comes down to one last Impossible Thing. This has been quite the journey and ended up taking much longer than I anticipated. I actually began performing the Seventh Impossible Thing back in March, but wanted to find the right venue before I made it official. 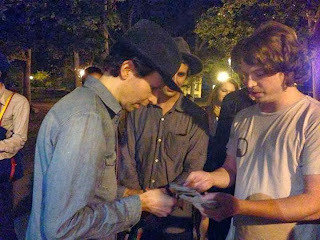 A huge inspiration of mine is the musician Beck. Even though I wouldn't consider myself a musician, I still find the parallels between his musical experimentation and the experimentation I do with my magic. It took a lot of work, but I had the honor to actually meet my idol last August and perform one of my favorite card effects to him, Binki Shapiro, and some of his crew. Almost ten years ago now, Beck had a few year run with the same backing band. They started to experiment with their songs seeing how they could play them in different locations, using other people's sound equipment, etc. They also tried to see how they could play songs from the album with a variety of different "instruments." I saw an "unplugged" VH1 special where they're playing songs using credit cards, Speak N' Spell machines, a banged up trash can, and even a fully set dinner table! I take inspiration from wherever I can, but it seems to come first and foremost from Beck, even before most of my magic mentors. Beck continued on over the next few years by revisiting some of his old styles, recording a bunch of quick "garage band" like tracks for the Scott Pilgrim soundtrack and one of my absolute favorite things; getting a random assortment of musicians together to cover a full album in 24 hours. That struck my imagination so greatly. I constantly looked to it for inspiration for my own projects, wondering if I could get a group together, or attempt a 24 hour magic session, or just bust into someone's house with a camera and ask them to record a routine. At the very least it spurred on my website as I branched out for more content to put on it. Beck's creativity went beyond just his music. His 2006 album had no cover art, but instead gave you a sheet of stickers to make your own. That album also came with a homemade music video for EVERY song on the album! Though he seems to be getting down to exploring music itself now. He seems to be simultaneously exploring the old and breaking music down to it's bare essentials while pushing for what else a song can turn into. He released a full album of sheet music with no recordings, he began exploring some of his early songs in concert and reimagining them with a full band, and he made music a 360 degree event as he covered Sound and Vision with well over 100 other musicians with a rotating audience! More recently he took 3-5 minute long songs and let them breath, seeing what they would sound like if they didn't have to fit into a three minute space and instead could occupy 15-30 minute time frames. I've been affected not just by his music, but his personal style as well. I've had haircuts modelled after his, I've made jackets that are based on things I've seen him wear, and I had a time period that I really liked fedoras as well! I even got some notoriety from MTV when I "covered" one of his sheet music songs using a card magic effect. Beck has a new album coming out in less than two weeks. The theme of it seems to be going back to a time in your life and seeing how you've changed. Beck takes his band from 2002's Sea Change and revisits that type of album, but after years apart and even a large break from making music. Not to mention that Sea Change was an album of heartbreak and now he's a father of two and been married some years now. I'm also eager to see how the last six years of experimentation will affect the songs. I find myself in a similar situation, as I love to occasionally look back at where I've been, but I've also gone back and explored some of the earlier effects I've performed or even ones I essentially threw away in my youth. I am looking at routines I've done for years and trying to find new ways to do them. Not just new ways to say things, but looking for ways to perform in any situation with whatever happens to be around me. Asking questions like "What if I remove this part of the effect entirely?" Looking for ways to do effects without me touching the cards or things that don't involve cards at all. This sort of experimentation has lead to me performing some of my wildest and most personal effects. I am looking forward to challenges as well as performing in new situations. One thing I really hope to do is to perform Mind Reading on Skype with anyone looking for a chat (@SteveTheAmazing.) There's no sleight of hand that can be employed during a Skype chat where two people aren't physically in the room together. I want to be interviewed on a podcast or a radio show, I want to be given someone else's deck of cards, I want to do things that no one else can accomplish, I want to be able to do something at any given moment, and I want to positively impact the people I perform with. I think I am there. I've felt and realized now more than ever that YOU are the extra factor. YOU are my support band. And YOU are what makes all of this so much more interesting. No matter what art you enjoy, I sense that there are plenty of exciting things ahead for us all.